The Garden Table is a perfect match to the Garden Chair. 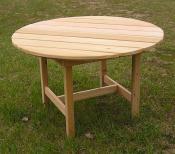 It's 46 inches in diameter, 28 inches high and can accommodate four Garden Chairs. Buy by the set and save: 4 Standard Garden Chairs and 1 Garden Table: $950.00 ($1,005 sold separately -- save $55). Or 4 Big Boy Garden Chairs and 1 Garden Table: $990.00 ($1,045 sold separately -- save $55).